LONDON, April 12, 2019 /PRNewswire/ -- The amount of optical cable installed per year globally has increased with a compound annual growth rate of 14% for 20 years, from 1997 to 2017. In 1997, the total installed was 37 million fibre-km. In 2017, installations reached 492 million fibre-km. Whilst the total installed last year exceeded 500 million fibre-km. This represents a substantial growth in annual demand especially in the last ten years. For example, it took the world's network operators around thirty years – from the late 1970s until 2008 – to reach a cumulative total of one billion fibre-km installed. Now, the world's cable customers are installing that amount every two years. 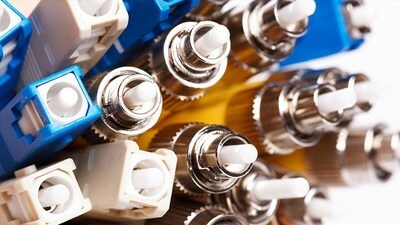 In recent years, China has accounted for more than half the world's total annual demand for optical cable. China's telecom network operators have installed fibre in the full range of telecom applications – inter-city, intra-city, FTTx, and mobile cellular systems. And as in other countries, China also has companies and government authorities installing fibre systems to support the electric power grid, railways, highways, pipelines, airports, WiFi hotspots, data centres, and many other applications. However, whilst total optical cable consumption surpassed the half-billion level in 2018, global growth slowed to just 4%, the lowest level since 2003. The predominant reason for lower global growth rates can be attributed to China, where there was a notable pullback in domestic demand towards the end of 2018. Indeed, CRU estimates Chinese demand contracted by 1% last year, whilst the volume of cable installed in all markets other than China grew by 10% from 2017 to 2018 in comparison. China's market will fall again in 2019, whilst the non-China markets will post a near double-digit increase, meaning the world's total optical cable installations will rise just 2% in terms of cabled fibre-km. China's market has entered a transition period – the three main telecom operators have completed the bulk of their work on 4G and FTTH networks, and China's 5G construction currently is limited to selected metro markets with large field trials. The transition period in China is not unusual. With the exception of a few carriers in Japan, South Korea, the US, and a few other countries, full-scale 5G construction is not expected until 2020 or later. What's different about China is that the country's carriers completed vast 4G and FTTH projects in a relatively small number of years, causing unusually high levels of fibre demand during those years. With China's FTTH networks now having passed over 90% of homes, and with more than 80% subscribing it has become increasingly clear that China's FTTx and 4G markets have become saturated with fibre and that demand from both sectors will be softer this year.